Not about what to eat, but how you eat it. In a comprehensive evaluation of adult beverages and Girls Scout cookies, dark beers paired well with the greatest variety of cookies. In the name of science about a dozen of my co-workers and I conducted a study paring 15 beverages with all eight varieties of Girls Scout cookies available in Portland, Oregon. Our tasting panel scored the pairings on a scale of 1-100. A score of less than 20 indicated that the paring likely generated nausea. A score of over 80 indicated that the taster would likely enjoy this pairing at home. Beverages were a potluck assortment of beer, wine, cider and liquor. The top pairing was Coconut Porter with Samoas. Tasters gave this paring an average score of 92. In their tasting notes, they wrote that the chocolate in the cookie brought out the richness of the beer and the coconut in both tied the two together. All four dark beers, Guinness, a nitro stout, a coconut porter and a vanilla oatmeal stout did well with average scores above 70. Surprisingly, Thin Mints were the easiest to pair. All Thin Mint pairings averaged a combined score of 75. Baileys and Adelaide’s Coconut Liquor both received scores in the high 80’s. Pinot Noir also snuck in as a great Thin Mint pairing with a score of 83. Toffee-tastics were the least liked and only paired well with vodka and hard cider. There were some unexpected surprises. 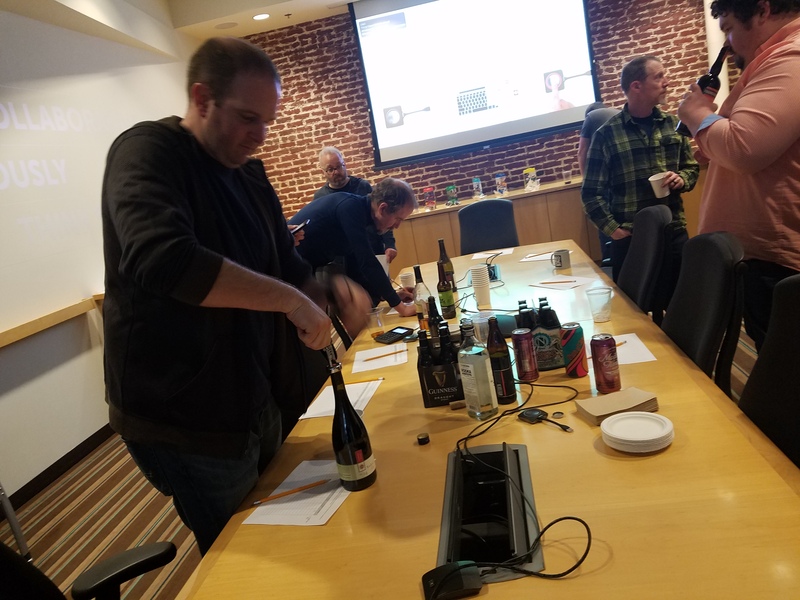 For example, our tasters really liked Arbor Brook’s 2016 Pinot Noir with Thin Mints. Tasters felt that the wine went well with the chocolate and the mint faded into the background for a pleasant aftertaste. Apple cider, which did not pair well with most items, did really well with the Toffee-tastic. “It tasted like apple pie,” said one participant. Not surprising, Maker’s Mark Bourbon, went pretty well with everything.